If your kitchen cabinets are looking worn, you could reface or replace them. However, you should first consider other, less expensive options, especially if the cabinets are structurally sound. In fact, if your home is more than 30 years old, you may find that the cabinets are of higher quality than most new stock cabinets. To spruce up your cabinets, you should first try cleaning and polishing them. Kitchen cabinets collect more grease, food spills, and moisture than most other parts of the house. Grime builds up fastest around handles of doors and drawers, which are constantly opened by sticky hands. Use a commercial cleaner meant for wood such as Minwax or Orange Glo wood cleaner. If you want to make your stained wood cabinets lighter, you can try bleaching them. 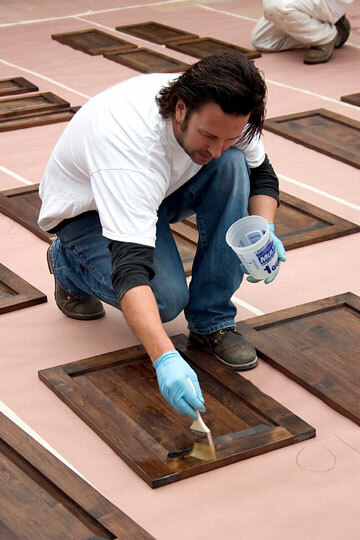 Commercial wood bleaches are often available at hardware stores and home centers. Alternatively, you can make your own wood bleach by mixing one part laundry bleach to 10 parts water. To use the wood bleach, apply the mixture, let it stand for a few minutes (more or less time depending on the amount of bleaching you want), and then wash the wood surface with plenty of water. Visit this page to learn more about using wood bleach on your cabinets. Another alternative for sprucing up your cabinets is to paint them with a high-gloss enamel paint. Which kind of paint to use? Latex paints are more user-friendly than oil-based paints because they dry quickly and clean up with water. However, they do take up to three weeks to cure fully, and they can be easily marred during that time. Oil-based paints require turpentine to clean up, but they form a harder, more durable paint film and level out to a smoother finished surface. Once your cabinets look beautiful, consider replacing the handles and drawer pulls for an updated look. CabinetHardware.us features information about cabinet hardware choices.